STATEWIDE DESIGN & ENGINEERING SVCS. In 2000, Alaska did not have a single roundabout. Now the state has 36 roundabouts with more on the way. You may be wondering, why so many roundabouts? The trend in Alaska mirrors the trend across the United States for a simple reason: they are much safer than a traditional signalized or four-way-stop intersection. 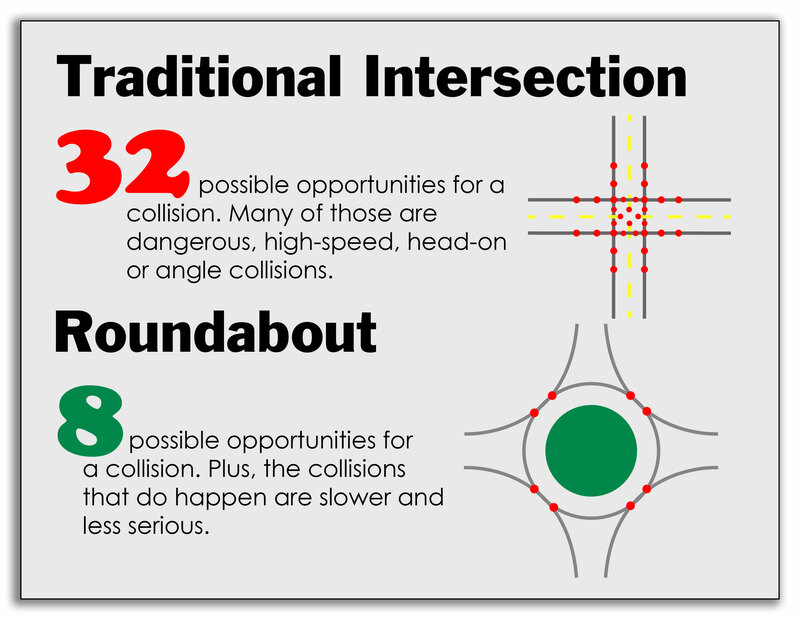 Fewer conflicts: In a traditional four-way intersection, there are 32 possible collision points. Vehicles turning right on red, turning left across on-coming traffic, speeding up to “beat the light,” failing to stop at the red light or stop sign—we are all familiar with the possibilities. At a single lane roundabout there are only eight possible collision points: entering the roundabout and exiting the roundabout. Fewer serious injury crashes: Crashes at roundabouts are not only less likely, the crashes that do happen aren’t as serious, because speeds through roundabouts are slower, and head-on and right-angle or t-bone crashes are virtually eliminated. Safer for pedestrians: In a roundabout, pedestrians only need to cross one direction of traffic at a time and vehicles are moving at a slower speed, which gives both pedestrians and drivers more time to react. How much safer are roundabouts? We have seen similar results at roundabouts in Alaska. In the ten years since roundabouts were installed at an intersection in North Pole, there have been zero injury crashes and a 68% reduction in crashes overall. The tremendous improvements in safety at roundabout intersections would be reason enough to consider a roundabout alternative, but there are other benefits as well. Reduce congestion: Traffic typically flows better in a roundabout during peak traffic hours and during slower times. You also don’t have to wait at a red light in an empty intersection or make a complete stop when there are no other vehicles in sight. Reduce fuel usage and pollution: There are fewer stops and hard accelerations at roundabouts, as well as less time idling. Lower long-term costs: Although the costs to construct a roundabout are comparable to a signalized intersection, less money is spent in the long-term due to lack of hardware maintenance and electricity costs. DOT&PF has adopted a “Roundabout First” policy, which states that designers must provide a written justification of any decision to install a traffic signal instead of a single-lane roundabout. Roundabouts are not appropriate for every intersection, but under the right circumstances, they can save lives, reduce injury, and save money. Slow down as you approach the roundabout. You will see the appropriate speed for the roundabout posted on the yellow sign as you approach the intersection. Be sure to watch for pedestrians in the crosswalk. Yield to traffic already in the roundabout. As you approach the roundabout, look to your left. Traffic already in the roundabout has the right-of-way. Enter the roundabout when there is a gap. When you see an appropriate gap in traffic, enter the roundabout. You do not need to come to a full stop if you can safely enter the roundabout without stopping. Once you have entered the roundabout, do not stop until after you have exited. Use your turn signal when exiting. 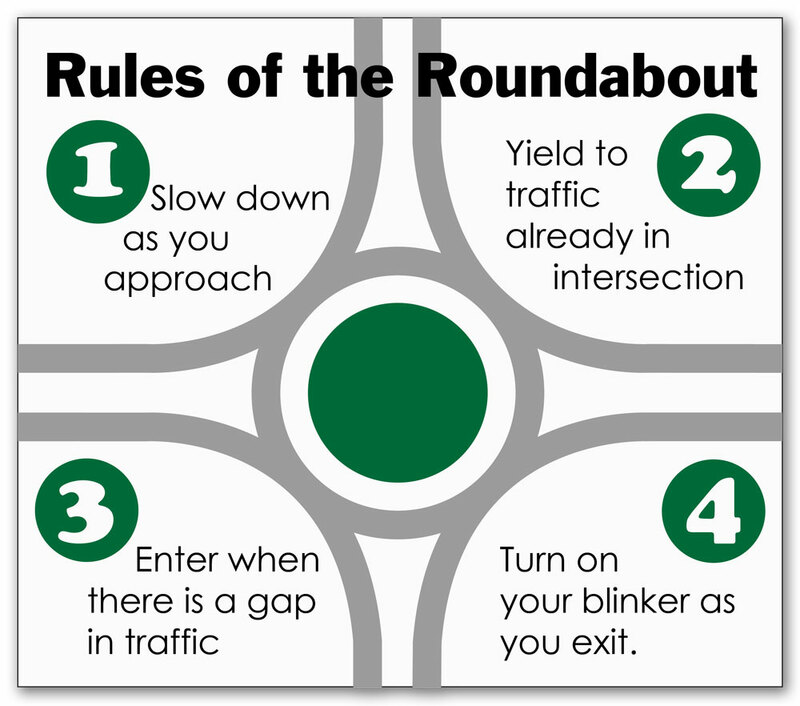 Alerting other drivers that you will be exiting the roundabout helps keep traffic flowing through the intersection. Several intersections near the Richardson Highway interchange at Santa Claus Lane and Badger Road in North Pole experienced a higher than average crash rate compared with similar intersections, with 12 injury crashes in the ten years prior to the roundabouts project. In the first seven years after three roundabouts were constructed near the interchange, there have been zero injury crashes. Many minor roads and driveways access Huffman Road between the Old Seward Highway and the Seward Highway. Traffic along this corridor made for risky left in and left out turns at the access points, and conflicts were common prior to construction of the roundabouts. The Huffman Road roundabouts have made travel on this corridor less risky and allowed DOT&PF to change several access points to right in and right out only turns, removing many left turn conflicts. As of January 2018, Alaska has 36 roundabouts, with several more planned in the coming years. Click on the map below to find more information on roundabouts in your community and throughout the state.